The focus on the Combilift stand at this year’s Health and Safety Event is on the company’s ever growing range of walk behind stacker trucks. Where possible and depending on the loads to be handled, there is a growing preference for pedestrian trucks due to the reduced risk that they pose not only to the operator but also to any other personnel or general public who may be in the vicinity. 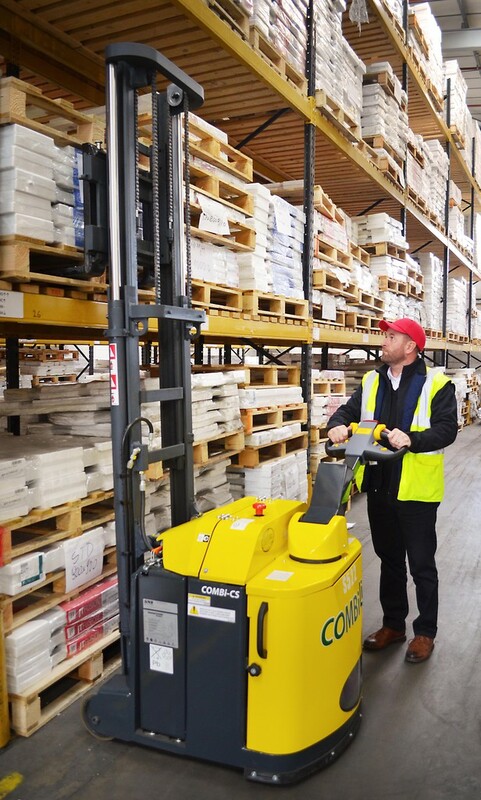 In common with all other Combilift products, the Combi-WR4 multidirectional reach stacker and the Combi-CS counterbalanced stacker have been designed to ensure space saving and productive operations, and they are also able to work in the narrowest aisles for machines of their type. A key feature of both models is the multi-position tiller arm, developed and patented by Combilift. It can be turned to the left or right of the unit to position the rear wheel, allowing the operator to remain at the side of the machine rather than at the rear as is the case with other pedestrian stackers. This position eliminates the risk of operators being trapped or crushed between the back of the machine and racking when picking and placing loads in narrow aisles and avoids the need for the operator to look through the mast, thus enhancing visibility.